Imam Abdenasser Zouhri was born in Morocco in 1955 and grew up in Algeria. He moved to the US in 1975 to study Industrial Engineering at the University of Massachusetts, Amherst. He is currently enrolled in a Masters Program in Islamic Studies at IOU and in sha’Allah will receive his degree this year. Imam Abdenasser has been a vital part of the Muslim community in RTP for many years. He served as the imam of Masjid Ibad ar-Rahman for 13 years and taught Islamic studies at Al Iman School in Raleigh for 10 years. He is also a founding member of the Carolina Islamic Council, a group of Imams from North and South Carolina that meet quarterly for lectures and workshops. He is a member of NAIF (North American Imam Federation). 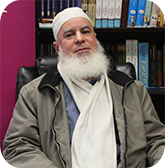 Imam Abdenasser resides in Morrisville with his wife and four children.